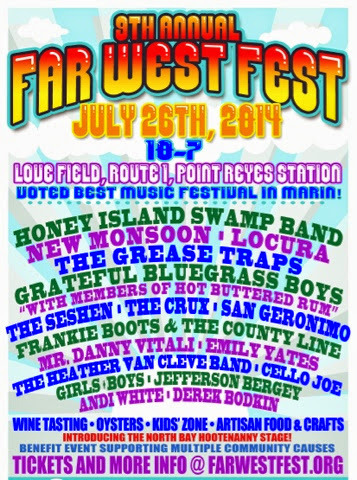 Voted BEST MUSIC FESTIVAL IN MARIN year after year, the 9th Annual Far West Fest is happening July 26th in Point Reyes. With gates opening at 10am, for acoustic Sunrise Café Sessions, you’ll find three stages of top-notch, original music from national touring acts and up-and- coming talent in a variety of genres from Bluegrass to Hard Funk to Deep Americana. The Far West Fest benefits worthy non-profits, including KWMR Radio, youth causes, West Marin Community Services and our home, Love Field. Come for wine tasting, artisan food delights (including oysters and BBQ), the award-winning, Roneil Powel Kidz Zone, and unique craft vending, all in a beautiful setting on a grassy, green site at the foot of Inverness Ridge. Early-bird discounted tickets and limited VIP options are on sale now. Please visit our website for line-up and more information.